Companies and individuals may publically confirm their ownership of a bitcoin address by going through the Bitcoin Whos Who verification process. 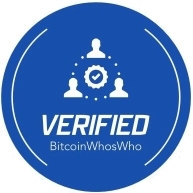 Once verified, your BitcoinWhosWho Address Profile will will reflect your verified status, and will also feature any additional info you would like to provide, such as a web address/link, company name, etc. By verifying your address you can let any potential customers, donors or other transaction partners double-check that they’re sending their payment to the correct address, and not one from a phishing website or other scam. By sending a small payment from your bitcoin address we’re able to verify your ownership and connect your email address as well as your company name, web address, or other desired details. – In the Order Notes box on the checkout form, please enter your website address URL, website/company description, and any other additional info you’d like to connect with your bitcoin address. This step is optional – your profile page on BitcoinWhosWho only requires an email address. – Phone number is optional. Only enter your phone number if you would like to include it on your profile page. Separate verification is required. – Your company name or website and the additional info you provide in the Order Notes, will appear on your profile page on bitcoinwhoswho.com. Your info may also appear on our Recent Verifications page. – Once payment is confirmed on the blockchain it may take up to 24 hours for your claim to become visible on the website.